The WSJ points to a new comScore survey detailing who’s buying iPads. The most interesting piece to note is that iOS still trumps Android with 59% more people being exposed to iOS than Android. The finding is incredible because it shows that Android being the most popular smartphone is not the whole story, said Mark Donovan, the senior vice president of mobile at comScore. Publishers, developers and advertisers are trying to understand how to reach audiences, and the study shows that users are using a range of devices. 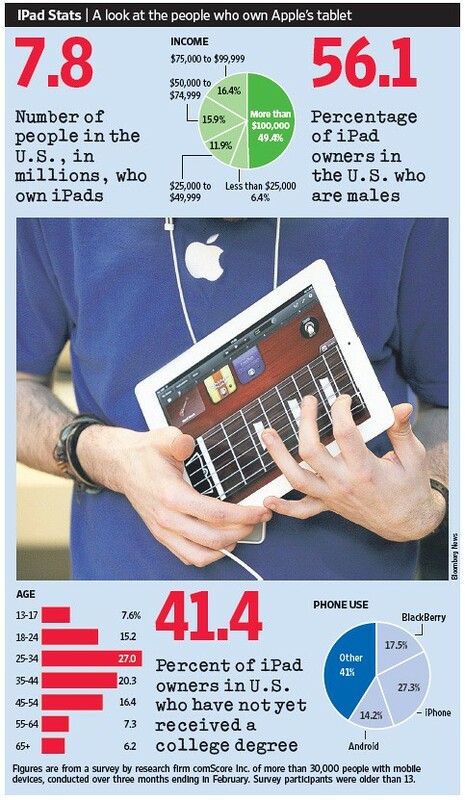 56.1% percent of iPad owners are male and 49.4% of iPad owners have an income greater than $100,000 per year. 27% of iPad owners are between the ages of 25-34 and 41.4% of iPad owners do not have a college degree. Something interesting to note is that 6.2% of iPad owners are senior citizens. Even more interesting is the accompanying smartphone that iPad users carry: 27.3% of iPad users rock iPhones, 17.5% have Blackberrys, and only 14.2% have Android phones.